But what is economically unrealistic is trying to survive in California on the wages of many of the lower-paid positions represented by UPTE and by AFSCME 3299 – the two unions that went on strike twice in 2018 and are gearing up for their second one-day strike of 2019. No doubt it is a real challenge for the UC executives and upper management, who got five digit raises last October, to relate to the economic reality of front-line workers’ lives. The UC system is swimming in money. UCSF medical center CEO Mark Laret makes upward of $1.1 million per year and a scathing state audit of UC President Janet Napolitano’s office discovered a $175 million slush fund. The priorities of UC need to be completely restructured to abolish tuition for California’s students and pay its workers a fair wage. The big corporations and billionaires of the world’s fifth largest economy should be taxed to fully fund UC. AFSCME and UPTE workers are rejecting increasing economic inequality within the university and are fighting back. Low-paid workers are sick of doubling and tripling up in overpriced apartments or driving to work from farther-and-farther-flung suburbs. Better-paid health-care workers are rightly rejecting any concessions on benefits or wages relative to inflation. Union leaders – building on the increased popularity of going on strike after a massive strike wave by public school teachers that is not yet over – have shown they are not afraid of going into battle by taking their memberships out on multiple strikes. The UC executives along with the appointed regents who ultimately govern the UC purposely dragged out negotiations in early 2018, waiting for the anti-union Janus decision to come down from the Supreme Court in the hopes that the unions would be decimated. Janus had an impact and represents a defeat for unions, but was by no means fatal. UPTE in particular has seen the rapid development of a whole new layer of activists, particularly younger workers who are caught between declining wages relative to inflation and the extremely high cost of housing. UC management is probably disappointed that its dream scenario of a collapse of public sector unions didn’t come true, but they remain a powerful and determined adversary. To win a strike workers need to shut down production and be prepared to escalate and widen the strike. 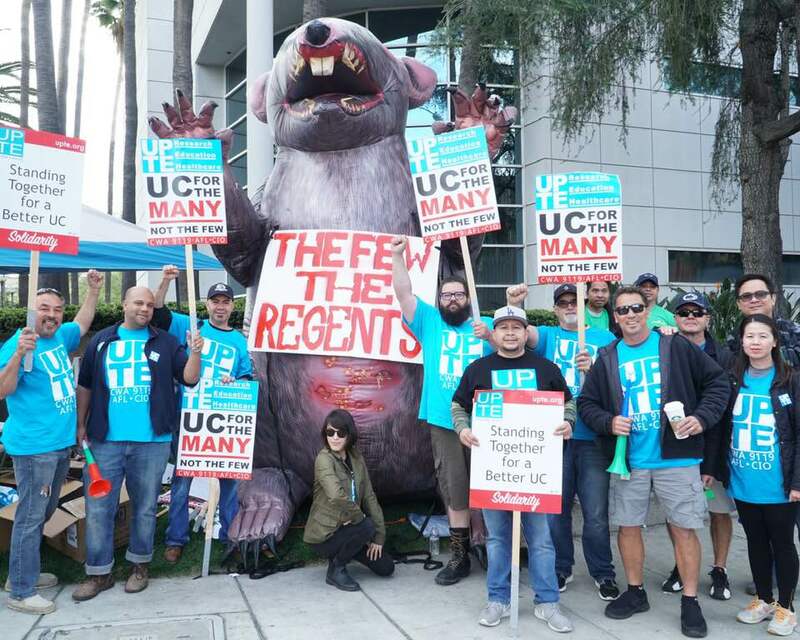 UPTE and AFSCME strikers have picketed the universities and medical centers up and down the state but they haven’t fully challenged UC management by organizing for a comprehensive shutdown of the university system. In the hospitals, a limited amount of work must continue to ensure vulnerable patients are cared for, but this can be a small fraction of a regular day’s work. When the nurses organized in CNA struck alongside AFSCME and UPTE last May, many patients were transferred to other hospitals in anticipation of the strike. It’s worth noting that CNA settled a contract with the university following the May strike that included substantial raises. AFSCME and UPTE workers have now been out of contract for up to two years. It’s time to take strike action to the next level and build a mobilization that can shut the university down: classrooms, labs, and, excepting essential life saving care, the medical centers. Shutting the entire University of California system would require the active solidarity of thousands of workers who are not currently fighting for a contract and who would have to challenge the law in order to strike. Teachers in West Virginia, Oklahoma, Arizona, and other so-called “right to work” states walked off the job – and won – despite anti-union laws. In West Virginia, militant tactics got the goods in the form of pay raises for both teachers and other state workers that would never have been won without coordinated strike action all across the state.The response from teachers and school workers as well as the support from the community was so solid that during the strike all the school districts in West Virginia closed completely as the administration recognizing there were no staff available to teach or even just do basic supervision of students had they come to school. Oakland teachers who recently won gains after a seven-day strike, kicked off the struggle by using mass sick-outs at several high schools before the official strike was called. The one-day sick-outs helped radicalize more teachers and galvanize and prepare the community to actively support the teachers’ struggle. A critical aspect of the resurgence of the labor movement over the past year is the willingness of workers to organize mass pickets to stop production completely. UC workers from different job categories across the system should unite for a one-day work stoppage aimed at shutting the university down. Residents and interns – fancy terms for doctors completing their training – are signing up with a union and have already taken action at UCSF by walking off the job for 15 minutes. Post-doctoral workers, a major component of UC’s research workforce, are going into bargaining soon and another group of academic researchers is in the process of forming a union. If UC workers across the system were to strike and sick out together – even those currently under a union contract – in a mass mobilization, we could bring the functioning of the university to a halt and begin to change the balance of power for all workers at UC. We need to begin to organize for a one-day strike across the entire University of California system, where all 190,000 faculty and staff join UPTE and AFSCME members’ fight to force management back to the bargaining table with a decent offer. Worker solidarity and a coordinated strike strategy can help win a good contract for UPTE and AFSCME and it can also set the tone at the bargaining table for the residents, interns, and post-docs. As a first step, UC union leaders should organize and seriously promote a mass meeting on each campus open to all non-management workers, organized and unorganized, to prepare a statewide day of action to close down the entire UC system. Such a shutdown could include legal strikes, sickouts, and mass pickets to bring UC back to the table. Union power, led by the teachers, is being rebuilt following a long period of defeats to the labor movement. The deck is stacked against us in the form of anti-labor laws, but that hasn’t stopped the teachers in states with some of the most restrictive laws in the country. But building the labor movement in the U.S. has always meant facing determined employers with the law on their side. A big win is possible for UC workers if we take steps to widen the strike and shut UC down. And a big win for 42,000 AFSCME and UPTE workers will reverberate in future union negotiations not only at UC, but across the country.